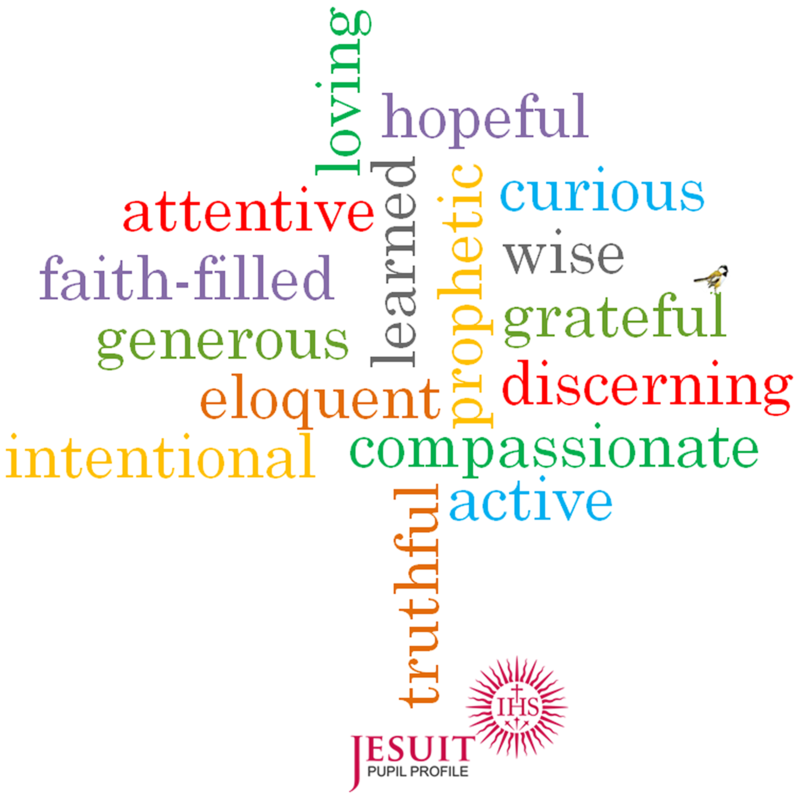 The Jesuit Pupil Profile has been developed by the schools of the British Jesuit Province as a successor to the Jesuit School Leaver Profile published in 1995. 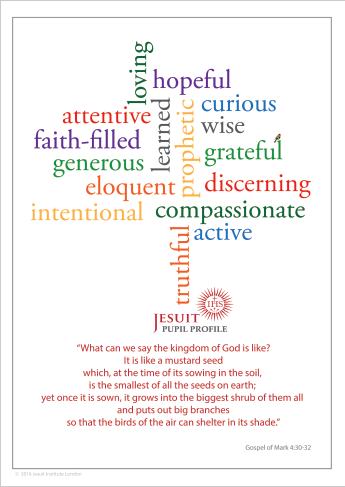 The new Jesuit Pupil Profile was launched in the schools in the autumn term of 2013.
to propose a simple but challenging statement of the qualities we seek to develop in pupils in Jesuit schools, using key words which unfold Ignatius' own stated aim of "improvement in living and learning for the greater glory of God and the common good." 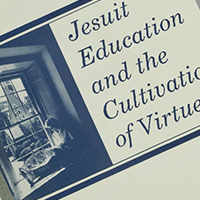 to produce a profile that describes the whole process of Jesuit education (from age 3 or 5 or 11 or 17 - the common ages of entry into our schools in Britain) rather than that of a school leaver. to create a JPP image in the style of a tag-cloud which can be used alongside the formal statement. Both image and statement are designed to provide a rich resource to stimulate discussion in class, assemblies, retreats and liturgy, in meetings of governors, withschool leaders, teachers, support staff and parents; and which can be used to explain to prospective parents the aims of Jesuit education. 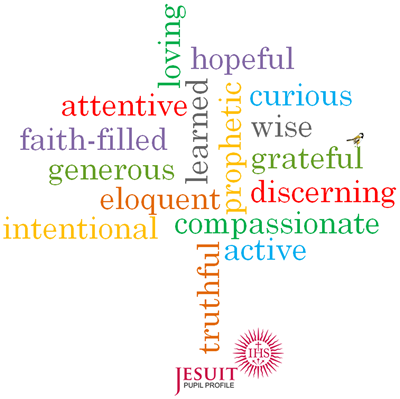 The JPP proposes eight pairs of virtues that sum up what a pupil in a Jesuit school is growing to be. 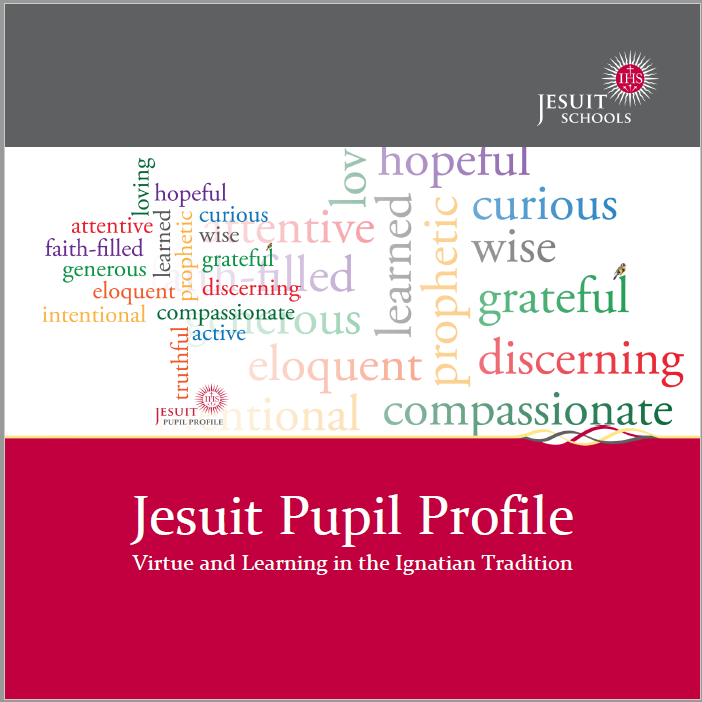 Alongisde the pupil profile itself, we have developed a parallel statement of what a Jesuit school does to help its pupils grow in the virtues listed in the JPP. There is also a brief expansion of the profile explaining its gospel and Ignatian roots. 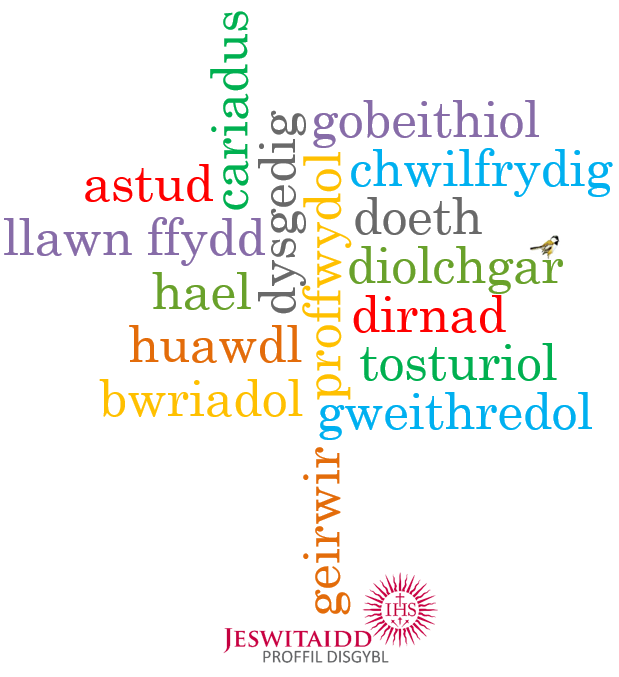 We have developed a tag-cloud style image which can be used (especially with children) to discuss the virtues of the JPP. The image is in the form of a tree, drawing on the parable of the mustard seed (Mark 4:30-32). 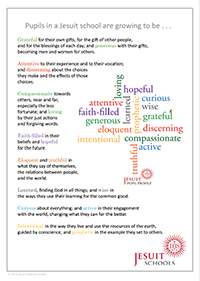 The pairs of virtues are colour-coded and this colour-coding is used in the JPP printed leaflet. Printed copies of the JPP leaflet, A6 postcard and A2 classroom posters are available from the Jesuit Institute. 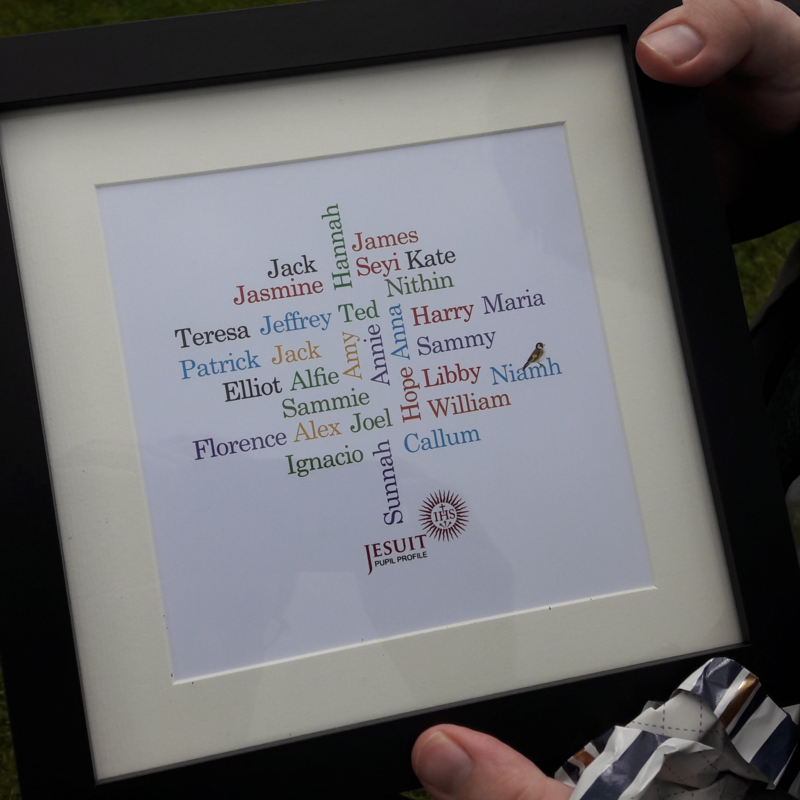 Here is a lovely idea from Mount St Mary's College: their pupils have grown up with the JPP so on the day they left the school (Valete Day) they were each given a framed version of the JPP with their names taking the place of the virtues. The kind of people they had grown to be. 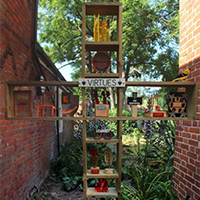 The boys at Wimbledon College designed and created 3D objects expressing the eight pairs of virtues of the JPP and made a permanent artwork in the school grounds. Can Positive Psychology shed any light on how Ignatian spiritual practices might increase ‘Subjective Well-Being’? 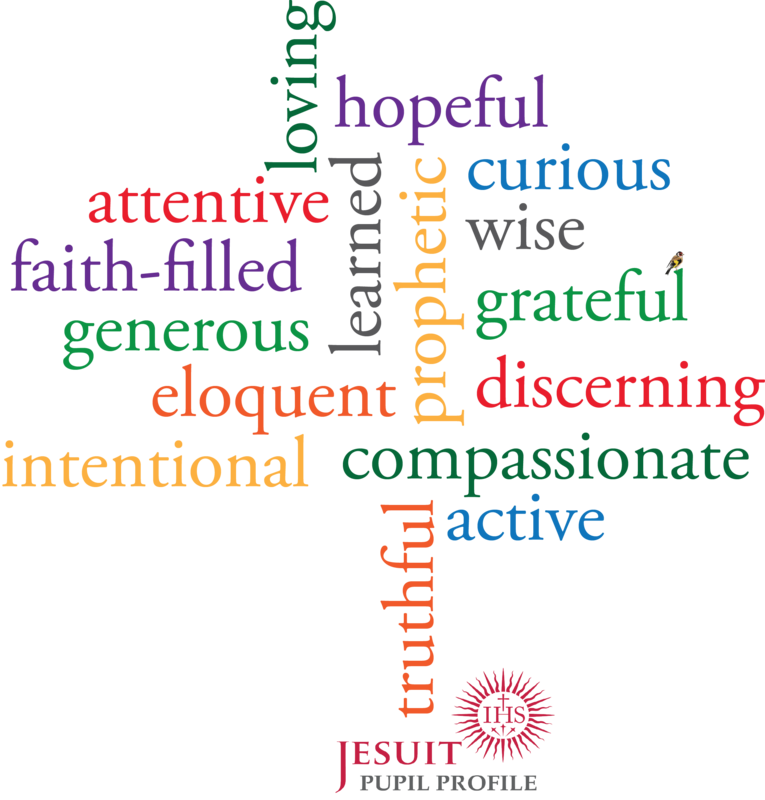 The Jesuit Pupil Profile, tagcloud image and logo are copyright 2013. 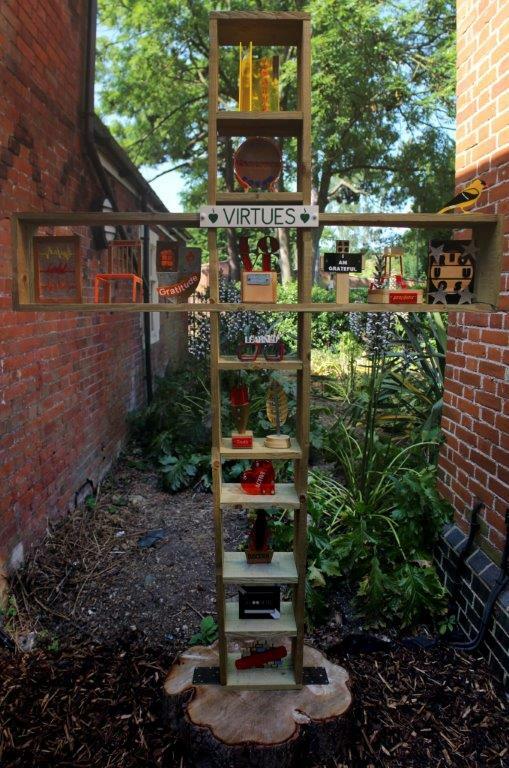 The Jesuit schools of the British Province have permission to use them freely. If you wish to use or adapt this material and are not a British Province Jesuit school, please ask first.